Our classic men's Lightning volleyball shoe offered in a mid-cut model. With a secure fit, you will feel more supported through your quick movements side to side. The outsole features the Dura Shield feature was designed with your hitting approach in mind for a smooth kick off and more acceleration power. Sensorpoints in the outsole offer support for a softer landing and more precise movements with every step. Featuring a mid-cut top, this model offers extra security up the ankle for added stability. 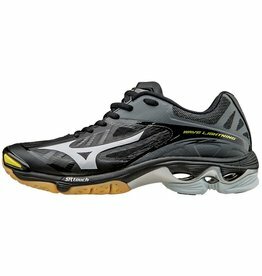 A great shoe for all positions, this lightweight model is ideal for pin hitters and setters who move quickly around the court.